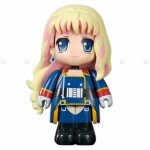 Akhibara News has revealed an image of the Sheryl Nome USB Flash Drive, from Macross Frontier. It’s made by Buffalo, and combines the looks of a designer toy with the functionality of a data storage unit. Data capacity is 4GB. Discuss on the Toyark Forums› Views: 1689 › Credit: eriku of the Toyark Forums!